Google in its doodle on April 30, 2016 payed homage to Claude Shannon, the pioneer of the modern Information Age. Without his breakthroughs in information theory and his coinage of the terms like ‘bits’ not much would have been possible in the Internet domain. 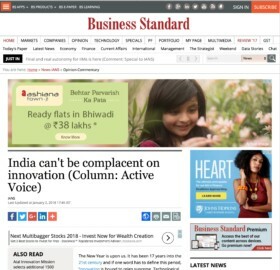 Needless to say the IT bandwagon on which India built a modern software outsourcing industry was the one of the important fallouts of Shannon’s contribution. An important question which arises is thus is what kind of policies are good for the growth of IT and related industries. 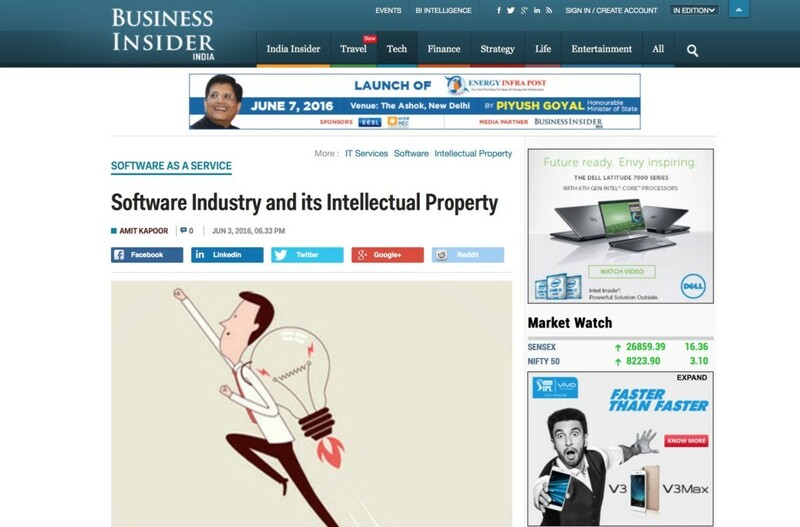 Importance of Patent Rights and the issue of patentability? An important component of the policy framework that governs the sector is the issue of intellectual property rights. Traditionally patenting has been recognized as being important in most industries. It is because patents provide economic opportunity to trade rights within specific industries thus enabling economic growth. 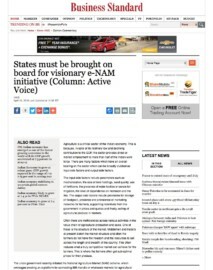 These rights also enable other companies to develop the technology further. Patents also enable startup companies to attract capital and compete effectively with powerful market incumbents creating a level playing field. Another reason why patents are important is that they provide companies an incentive to invest in strategic and risky investments in R&D. Increasingly some patent lawsuits have resulted due to assessment of a fundamental question – namely what is patentable or in other words what can be patented. This is where the recent decision of the The Office of Comptroller General of Patents, Designs and Trademarks (CGPDTM) becomes important in light of its narrow conception of patent rights. A lot of debate seems to be happening around the issue of open source collaborative platforms in software versus the closed source licensed platforms. A classic example in a field of mobile technology is Apple iOS versus an android platform. The Apple iOS is more standardised and closed with some open source components. Android on the other hand is based on open source and is Linux based which gives it more customisability. Both these sets of technologies and approaches to software development have different positives and negatives. The debate on open versus closed seems to depend on takers in the form of consumers in the market. From a programmer and enforceability perspective patenting seems to have cause more harm than benefits globally. However, from the protection of a rule based rule of law and level playing field perspective the approach does have its benefits. Recently, The CGPDTM issued guidelines for the examination of Computer Related Invention (CRI’s). The Office of Comptroller General of Patents, Designs and Trademarks is the apex body for filing and protection of IP. These are clear but narrowly conceived. 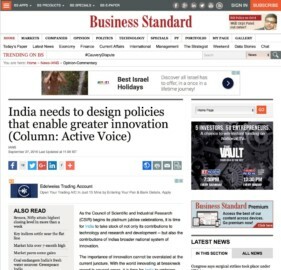 The environment for protecting (Computer Implemented Invention (CIIs) in India has been marred by uncertainty for a number of years. Existing guidance documents, including the Indian patent manual, did not provide clarity on the extent to which CIIs were patentable. Draft guidelines published in 2013 by the Controller General presented a rather narrow interpretation of what constituted a CII and under what circumstances a CII was in fact patentable. Specifically, these draft guidelines suggested that CIIs applied or operating through a “general purpose known computer or related devices” were not patentable. In contrast, the guidelines published in August 2015 (Guidelines for Examination of Computer Related Inventions) provide for the broad patentability of CIIs including in operation through not only novel hardware but also “known hardware.” The publication of these guidelines and the potential expansion of the patenting of CIIs with the use of these new guidelines by the Controller General would have been a major step forward for India’s national IP environment and a boon to the software industry in India and beyond. Unfortunately, the Controller General of Patents announced in December 2015 that these guidelines would be “kept in abeyance” until further notice. 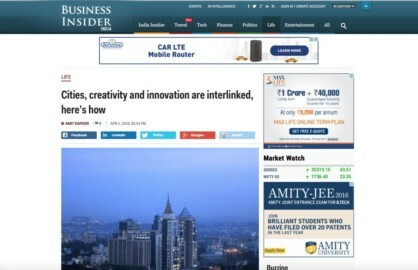 Internationally IP is considered as an important component for innovation and investment. As per India fact sheet in this year’s GIPC (Global Intellectual Property Center) IP Index India is placed at a dismal 37th rank out of a total of 38 countries considered for the Index. 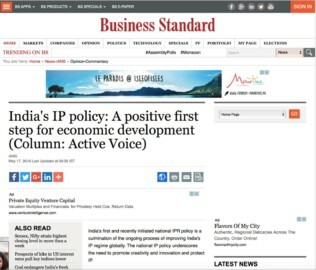 2015 saw a number of positive steps taken in IP that would have potentially increased India’s score. Specifically, the publication of new guidelines for patentability of CIIs would have provided a greater level of clarity on what until now was a grey area of patentability. Unfortunately, in late 2015 these guidelines were suspended until further review by the Indian authorities. The environment for protecting CIIs in India has been marred by uncertainty for a number of years. Existing guidance documents, including the Indian patent manual, did not provide clarity on the extent to which CIIs were patentable. Draft guidelines published in 2013 by the Controller General presented a rather narrow interpretation of what constituted a CII and under what circumstances a CII was in fact patentable. Specifically, these draft guidelines suggested that CIIs applied or operating through a “general purpose known computer or related devices” were not patentable. In contrast, the guidelines published in August 2015 (Guidelines for Examination of Computer Related Inventions) provide for the broad patentability of CIIs including in operation through not only novel hardware but also “known hardware.” The publication of these guidelines and the potential expansion of the patenting of CIIs with the use of these new guidelines by the Controller General would have been a major step forward for India’s national IP environment and a boon to the software industry in India and beyond. Unfortunately, the Controller General of Patents announced in December 2015 that these guidelines would be “kept in abeyance” until further notice. It will be interesting to observe developments in the IP domain as well as key debates like the open versus close debate over the next few years. 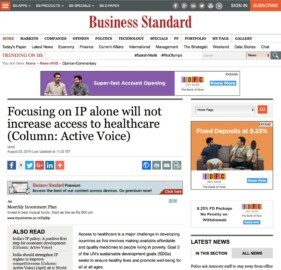 There is a need to find mechanisms to make IP laws work well and enforceable. With regards to patentability, public policy seems to be clear but narrowly defined on what is patentable and what is not especially post the guidelines. 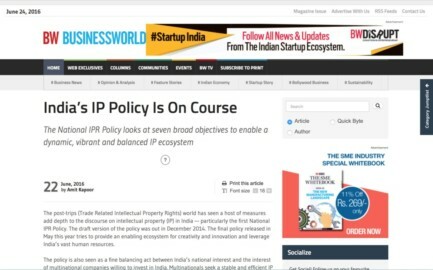 Over the next few years India should aim at streamlining processes as well as capacity building for making its IP regime even more harmonized with the international IP laws.